When Marvel's Star Wars: Poe Dameron comic arrives in stores next month, it will be the first official glimpse fans have had of the dashing flyboy hero since his introduction in The Force Awakens --- and with Episode VIII still a couple of years away, the ongoing series may be the only fix of Poe we get for a while. That means there's a lot of pressure on writer Charles Soule and artist Phil Noto to satisfy the fans. 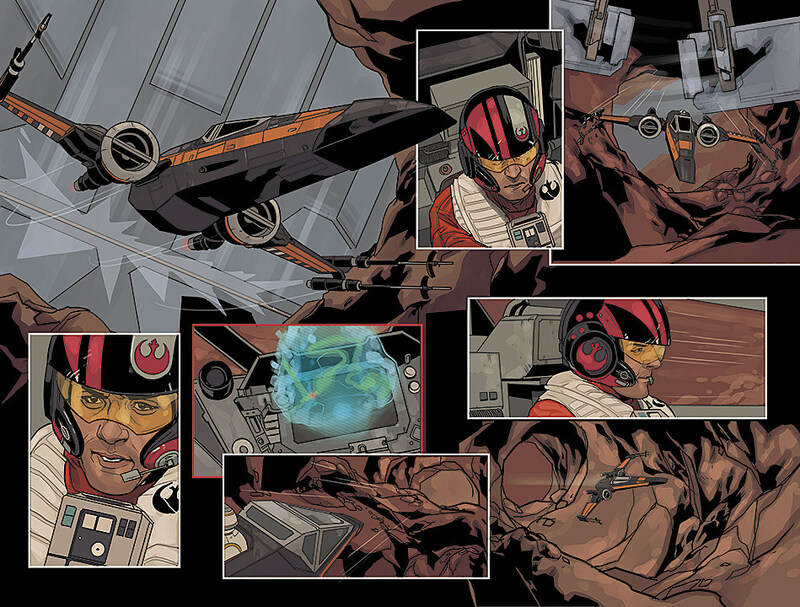 Judging from the preview pages released by Marvel, we can at the very least expect entertaining skybound antics, Poe Dameron looking handsome, and some probably adorable interactions with BB-8. That's pretty good for four pages, but it does leave one big question unanswered. Namely, will this comic introduce the ex-boyfriend that broke Poe's heart and left him vulnerable but ready to love again when he first ran into (and named) Finn? Come on, we're all thinking it. Strap in and lock s-foils in attack position because one of the breakout stars of the Star Wars™: The Force Awakens is getting his very own ongoing series! Marvel is pleased to present your first look inside the highly anticipated STAR WARS: POE DAMERON #1 – coming to comic shops and digital devices this April! Superstar creators Charles Soule (Lando, Obi-Wan and Anakin) and Phil Noto (Chewbacca) take you to a galaxy far, far away for the new adventures of Poe Dameron – former Republic flyer turned Resistance fighter and the best pilot in the galaxy! Plus – this oversized first issue features a special back-up story starring none other than BB-8! Writer/artist Chris Eliopoulos (Hawkeye) brings you an 8-page tale of everyone’s favorite spherical astromech droid as he embarks on a journey all his own! The adventure begins this April as the Resistance’s high-flying aerial ace comes to comic shops and digital devices in STAR WARS: POE DAMERON #1! Next: Is Poe Dameron Gay, And What Are We Going To Do If He's Not?